This month's Pickle Barrel color palette is so soft and pretty, with a definite Valentine's Day feel. Amber has taken those colors and created an adorable kit full of hand-drawn love. Take a look. The CT has created some lovely inspiration pages for you. Make sure you get all the pieces to this sweet kit while they're on sale for $1 each! 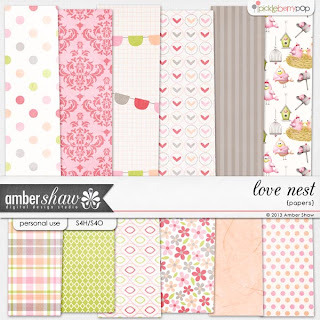 Last but not least is a sweet little freebie from Amber to go with all of your $1 bargains!